"Toss a pebble in a pond. The waves may spread far beyond what you expect. The life of a DeMolay may be like that pebble. I learned that taking a stand for what is honorable can make a difference and spread out to influence the lives of many. In this way, DeMolay builds better citizens and better lives. " At age fourteen, Raoul Frevel joined DeMolay at the insistence of his father. DeMolay became a springboard, propelling him into a life of service to DeMolay and Masonry.At age fourteen, Raoul Frevel joined DeMolay at the insistence of his father. DeMolay became a springboard, propelling him into a life of service to DeMolay and Masonry. As a youth, Frevel served as Master Councilor, State Master Councilor, and finally, in 1971, he reached the highest office an active DeMolay can obtain - he was elected International Master Councilor. Once Frevel reached majority age, he was not satisfied that his ability to serve DeMolay was complete. He began serving as an adult advisor, eventually being appointed Executive Officer of Maryland from 1995-1997. He has been awarded the Degree of Chevalier and the Legion of Honor. Frevel currently serves as an active member of DeMolay's International Supreme Council. In 1992, Frevel served as Potentate of Boumi Temple in Baltimore, Maryland. Upon completion of his year, he decided to run for the Imperial Line of the Shrine of North America. His dream came true in 1994, while still serving as Executive Officer for DeMolay in Maryland. He is only the second person to serve the Imperial Shrine and DeMolay at the same time. The first was "Dad" Frank S. Land, the Founder of DeMolay, who served in both capacities fifty years earlier. 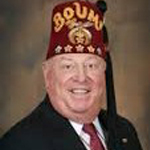 Frevel currently serves the Imperial Shrine as Deputy Imperial Potentate, 2nd Vice President of the Colorado Corporation - Shriners Hospitals for Children, Chairman of Building and Equipment for the 22 hospitals in the Shrine network, and Chairman of the Shrine's Room East, located at the George Washington Memorial in Alexandria, Virginia. In October 1997, the Supreme Council of the Ancient and Accepted Scottish Rite of Freemasonry for the Southern Jurisdiction of the United States of America conferred upon him the degree of Inspector General Honorary 33. Frevel is a member of the Red Cross of Constantine, past Director of Baltimore Court #82 of the Royal Order of Jesters and is a member of Teocali #100, Order of Quetzalcoatl. Frevel shares ownership of Atlantic Caterers, Inc., with his four siblings. He served as the CEO from 1974-1998 and is currently an advisor-consultant. His civic interests include membership in the National Association of Catering Executives, Past President of the 40 West Lions Club, member of Loyal Order of Moose Lodge #831, and an honorary member of the Fraternal Order of Police, Lodge #4. Frevel also serves on the vestry of his childhood parish, St. Matthew's United Church of Christ. He is currently belongs to Trinity Evangelical Lutheran Church. He married Rosie in 1972, and they have two sons - Raoul, Jr., and Christopher. The boys are third generation Masons. Frevel was initiated into Tuscan Chapter DeMolay in Baltimore, Maryland, in 1965. Frevel was inducted into the DeMolay Hall of Fame on June 19, 2004. "Any success I've been able to achieve in my life - from building my business to my Masonic and Shrine activities - I owe to DeMolay." "Any success I have been able to achieve in my life - from building my business to my Masonic and Shrine activities, I owe to DeMolay."